If you are missing several (or all) of your teeth, you may face a number of daily struggles. You may find it a challenge to eat your favorite foods, smile with confidence, and speak clearly. Fortunately, you aren’t doomed to cope with those issues forever. An implant-retained denture may be able to permanently replace your lost teeth and restore full dental function. If you are interested in rebuilding your smile with dental implants, contact our team today to schedule your consultation. Traditional dentures rely on natural suction or a mild adhesive to stay in the mouth. Therefore, although they provide a natural appearance and a measure of bite force, they are neither as sturdy nor as comfortable as real teeth. Implant-retained dentures, on the other hand, are anchored in the jawbone via small titanium posts. The implants act as substitutes for the roots of missing teeth and make sure that the denture they support never slips out of place. A fixed implant denture is permanently attached to the dental implants. 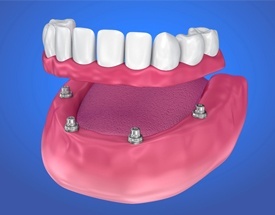 An overdenture is removable and snaps onto the implants with the help of small attachments. 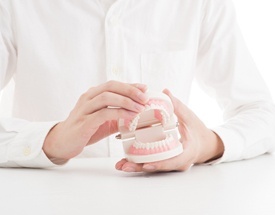 Sometimes, a traditional denture can be retrofitted to work as an overdenture. Am I a Candidate for Implant-Retained Dentures? You have lost all or most of your teeth. Your jawbone is strong enough and large enough to support dental implants. You are free of gum disease. You’re in fair overall health and don’t have any conditions that could slow down your healing time after dental implant surgery. 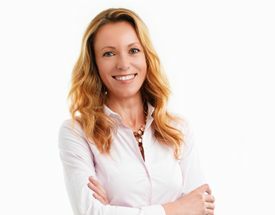 Even if you are not an “ideal candidate” for dental implants, you shouldn’t hold back from visiting our team for a consultation. With a bit of extra preliminary work and a few precautions, you may still be able to take advantage of this life-changing treatment. Once you’ve undergone any necessary preliminary treatment, such as extractions or a bone graft, you’ll have your implant placement surgery. Our dentists perform this minimally invasive procedure right here in our office, so you won’t have to worry about visiting an oral surgeon whom you don’t know. 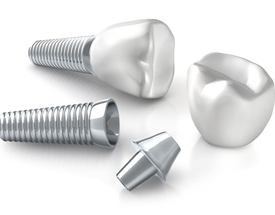 During the surgery, dental implants are placed at strategic locations throughout your jawbone. After your bone has had a chance to heal from the surgery, we’ll design your custom, implant-supported denture. Once the dental laboratory finishes creating it, you’ll return to our office so we can make sure it fits well before we attach it to your implants. The dentures are made out of high-quality materials that closely resemble the look and feel of natural teeth. The support of dental implants gives the dentures a bite force that is strong enough to stand up to practically any food. Because the implants help keep the jawbone strong, it will not deteriorate and become smaller over time. Therefore, you’ll never have to worry the fit of your dentures changing. Implant-retained dentures are easy to care for. In fact, caring for them is almost the same as maintaining natural teeth.